Physical and mental stimulation are essential in maintaining a dog's overall health and happiness. 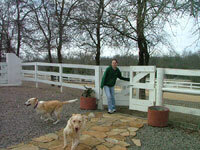 We at Woodland Park Pet Resort provide our guests with a wide variety of outdoor activity options. We have three large, beautifully manicured play yards, a multilevel swimming pool, and a nature trail. Normally, our guests never see a leash until it is time to go home (with the exception of nature walks.) With over 12 acres of entertainment on our McKinney property, our guests will never run out of things to do. All of our accommodations come with enough play times to satisfy even the most energetic guests. However, if you feel your dog needsa little extra attention, we offer a wide variety of additional activities. For the social dog, group playtime provides the greatest amount of mental and physical stimulation. Our staff handpicks up to six dogs which they think will enjoy each other and will quickly make changes if someone seems a little too exuberant or too shy for the group. 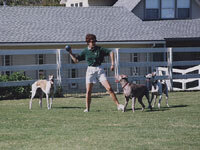 The dogs are given free reign to run, chase, wrestle and sniff for at least 20 minutes. Group playtime takes place in one of our spacious grassed play yards when weather permits and in smaller concrete and gravel areas during soggy weather. For those guests who just don't understand the appeal of running around with a bunch of "dogs," private yard time is available. For a minimum of 20 minutes, these guests are free to run, explore, or chase a squirrel in one of the large fenced yards. Some guests require a little more human contact than others. One-on-one time is sure to keep these attention-loving pups happy. For at least 20 minutes, one of our staff members will play ball or frisbee, take a nature hike, or just sit and love on your pet. If there is something else you think he or she might enjoy more, just ask. Almost no request will be denied. On a hot summer day (or for some dogs a cold winter day) nothing feels better than a belly flop into a cool swimming pool. Our pool is terraced all the way around, so swimmers can get in and out with ease. Guests can swim alone, or with a buddy, and they are always supervised. The Bedtime Walk is great for those accustomed to having one last 'potty break' before turning in for the night. It consists of a twenty minute playtime in the yard either alone or with friends, and turn-down service including a warm towel upon request.